We begin downtown, with a tour from 2002. The homeless bed down. It's disconcerting for visitors and maybe for residents, but taxi drivers show no mercy. "They get used to it," according to one who might have been a student of Dostoyevsky. 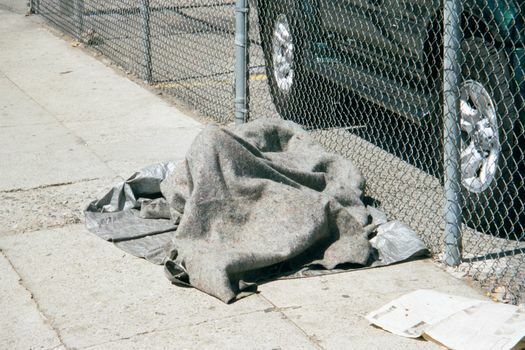 Was there anyone under this blanket? Absolutely: a knee moved. At dusk, cardboard boxes are set up, even sewn together to form tubes. Close by, the Linda Lea Theater on Main Street used to show first-run international movies. How often do you see a diocesan headquarters permanently locked? 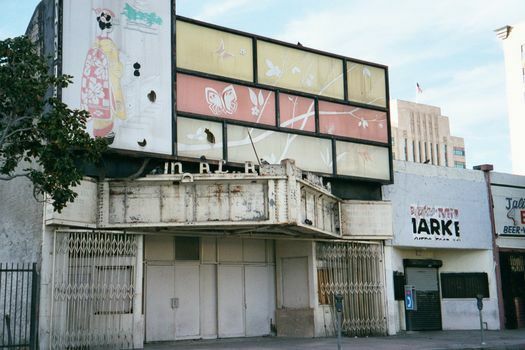 It's the product of a double whammy: downtown depopulation and the Northridge earthquake of 1994. 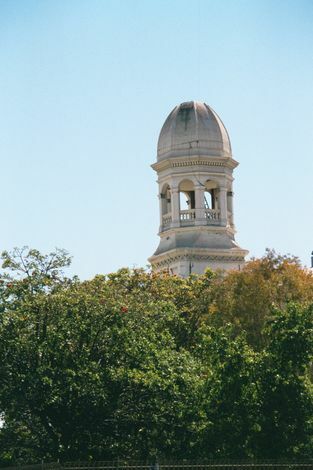 The cathedral bell tower. 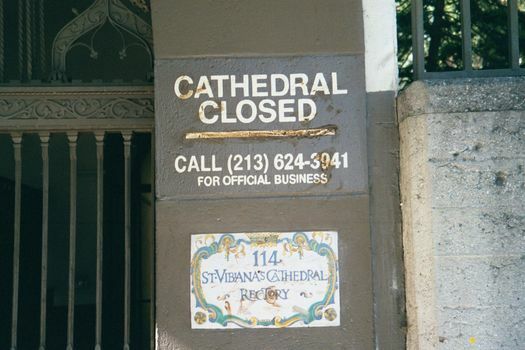 St. Vibiana's was built in 1876 and after the quake delisted as a city landmark. 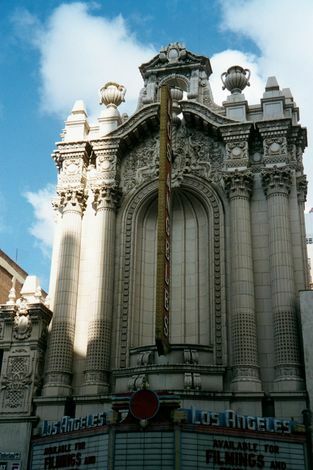 Although not evident in 2002, the cathedral had been purchased in 1999 for about $4.5 million by Tom Gilmore, and on 12 November 2005 it reopened as Vibiana Place, a performing-arts complex. Meanwhile, public buildings are transformed. 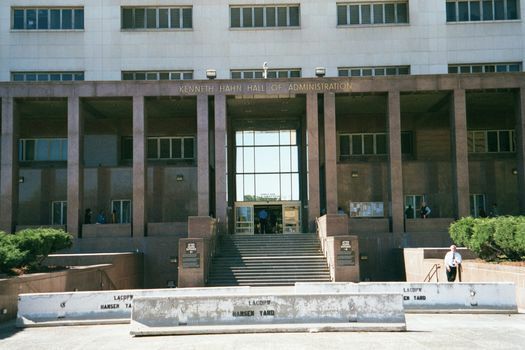 This one was completed in 1960. In 2002, when this picture was taken, the Jersey Barriers or K-rails were a new but wretched addition. 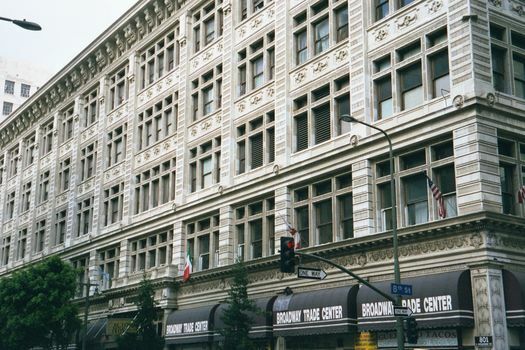 The former May Company department store was built on Broadway in 1906 as Hamburger's Department Store. It claimed to be the biggest department store west of Chicago. The department stores began leaving Broadway in the 1920s. 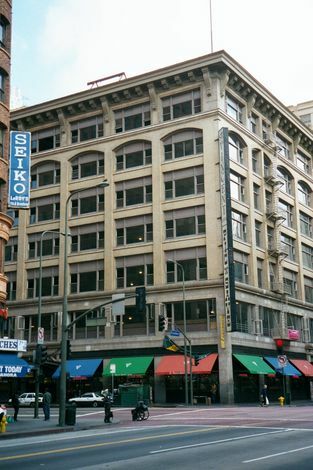 This former Bullock's, from 1929, closed when the company headed west and moved into a spectacular store on Wilshire. 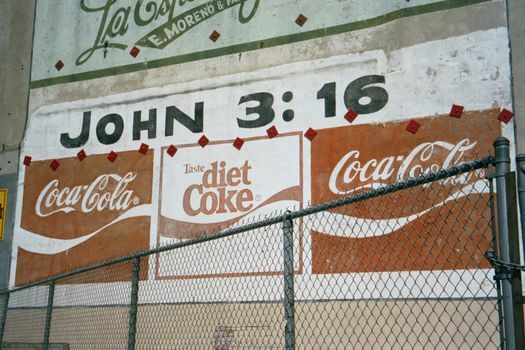 The company survived until 1996, when it was absorbed in 1996 by Macy's. 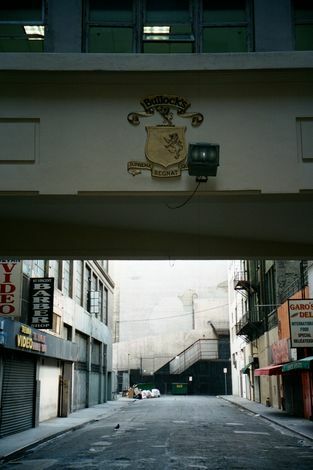 The only hint that this particular store was a Bullocks is in this alley, where on the bridge you can make out the Bullock's emblem, with its "supreme quality reigns" motto. 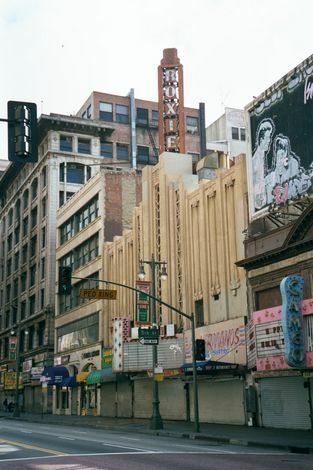 Broadway's once impressive theater district made the same westward jump in the 1930s. It left a big hole, minimally filled by shops but by 2002 slated for apartments. 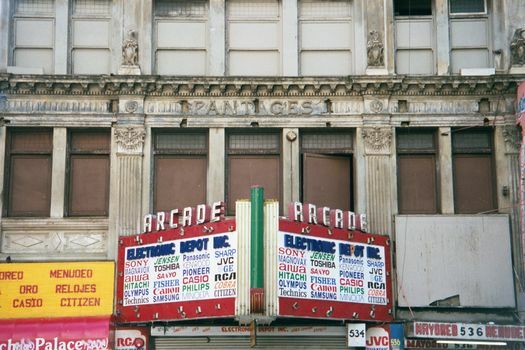 The Arcade had been the first Broadway theater, opening for vaudeville in 1910: you can still make out the name of Alexander "Something for Everyone" Pantages. 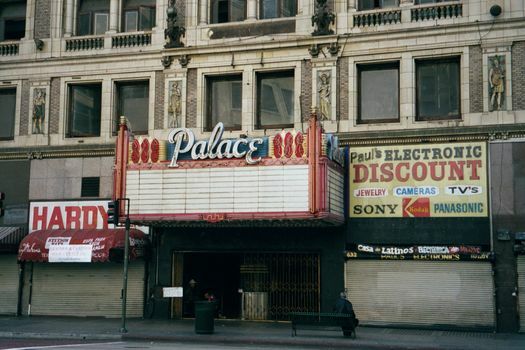 Competition came from the Palace Theater, opened in 1911 as an Orpheum Theater; it continued as such until 1926, when a new Orpheum opened down the street. 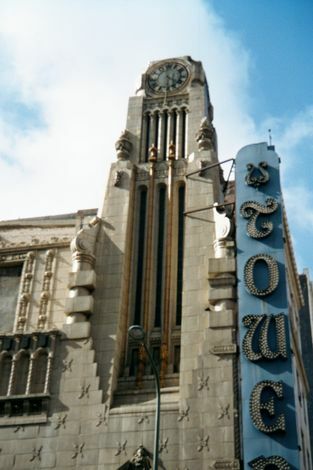 The Tower Theater was built in 1927. Later that year, The Jazz Singer premiered here. 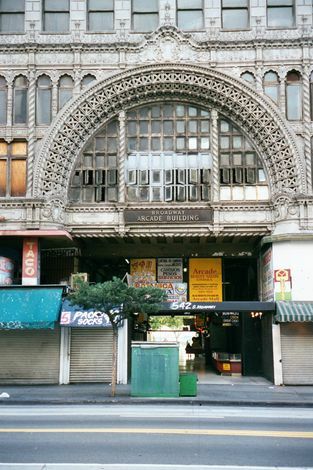 Across the street, the Los Angeles Theater was modeled on San Francisco's now-demolished Fox. It opened in 1931 to Chaplin's City Lights. Albert Einstein was in the audience. The Roxi, built in 1932, was the last of its kind. 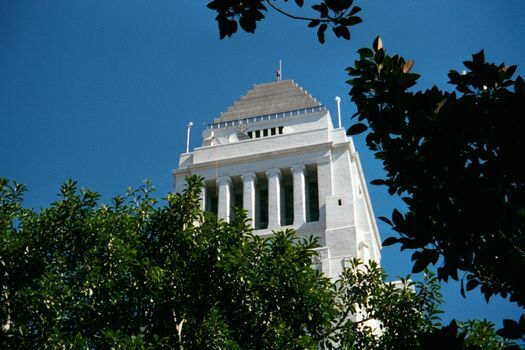 City Hall, built in the 1920s, was for about 30 years the tallest building in the city. 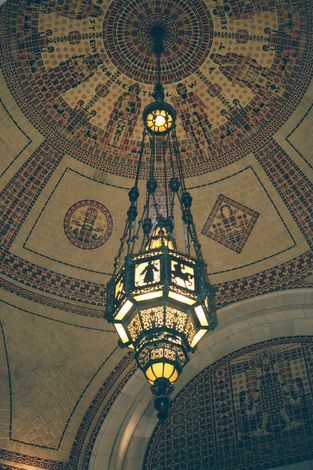 Its rotunda echoes the Taj Mahal, but all one of the building's exterior doors was locked in 2002, and that one was fitted with metal detectors and sign-in sheets. 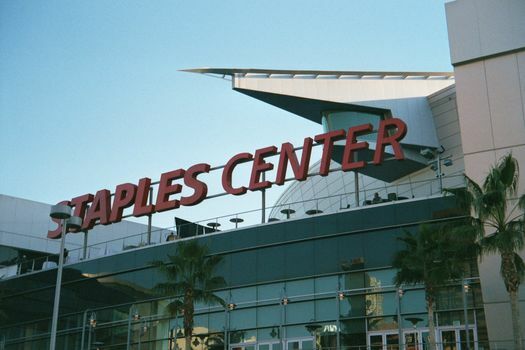 Germ of a new downtown: the Staples Center opened in October 1999 with a Bruce Springsteen concert; six months later, two million people had been inside.